CCS Cleaning and Restoration (formerly known as Carriage Cleaning Service) is Southern Minnesota's leading certified cleaning agency. With nearly 50 years of combined on-the-job experience, our team is the area's most seasoned carpet cleaning professionals. In business since 1974, our company's cleaning expertise allows us to effectively serve both the private and public sectors in various sized markets, including Faribault, New Prague, Bloomington, and Edina. Whether you operate a bustling business or a hectic household complete with kids and pets, our customer-oriented cleaning technicians can work with you to provide the deep-cleaning services you need. Restoration services for water damage, fire damage, mold remediation, and biohazard cleanup. Residential and commercial cleaning services, including the cleaning of rugs, upholstery, and tile and grout. Residential and commercial carpet cleaning services. Every day many home and business owners in Southern Minnesota trust CCS Cleaning and Restoration to effectively care for their carpets, rugs, floors, and fine furnishings. Customer care is our top priority! More than 50 years of combined, professional carpet-cleaning experience with all carpet and fabric types. At CCS Cleaning and Restoration, we are committed to first class customer service. It is only by treating you, your home, your business, and your belongings with the utmost respect that we are performing our jobs to the fullest. Along with that we welcome your cleaning questions and are happy to provide stain removal suggestions and techniques. 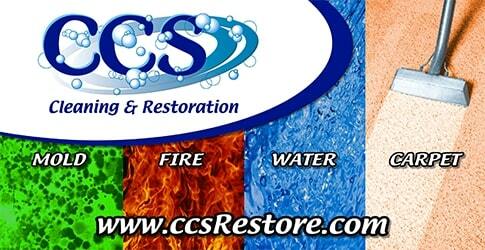 At CCS Cleaning and Restoration, we offer a 100 percent money-back guarantee. If you are not completely thrilled with the service you received from us, we will rush back to your location at no charge and no obligation to correct any remaining issues. If you are still unimpressed, we will issue a 100 percent refund. CCS Cleaning and Restoration is proud to be bonded and insured. As a member of an industry that performs services within your home, we understand that our honesty and professionalism plays an integral role in your selection of our services. For this reason, CCS Cleaning and Restoration performs thorough character, skill, and certification checks on all individuals prior to hiring them as cleaning technicians. At CCS, we are committed to providing the highest level of customer service, and display this by performing quality services in a timely manner at the best competitive price. Give us a call at 507-334-1774 if you have any questions or would like to schedule an appointment. You may also reach out to us any time via email, and we will get back to you within one business day. We welcome the opportunity to clean for you and earn your repeat business!